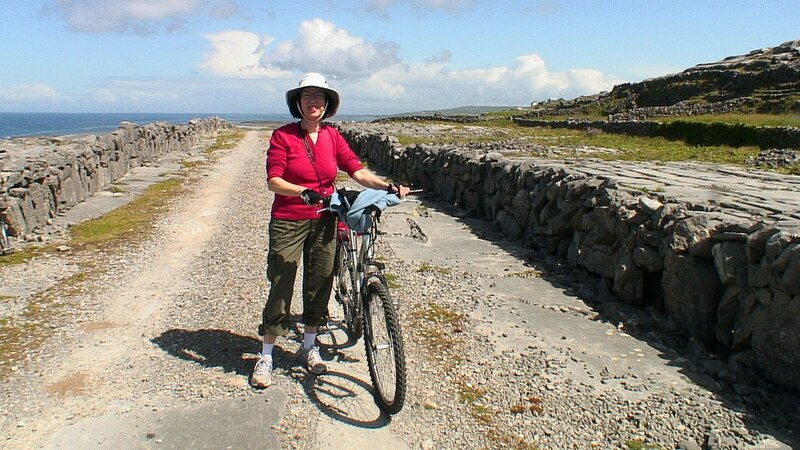 Bob and I had spent the early part of one morning touring the ancient fort, Dun Aonghasa, and photographing the wide variety of wildflowers at that location, so by the time we returned to our accommodations at Kilmurvey House, our rental bikes were ready and waiting for us. 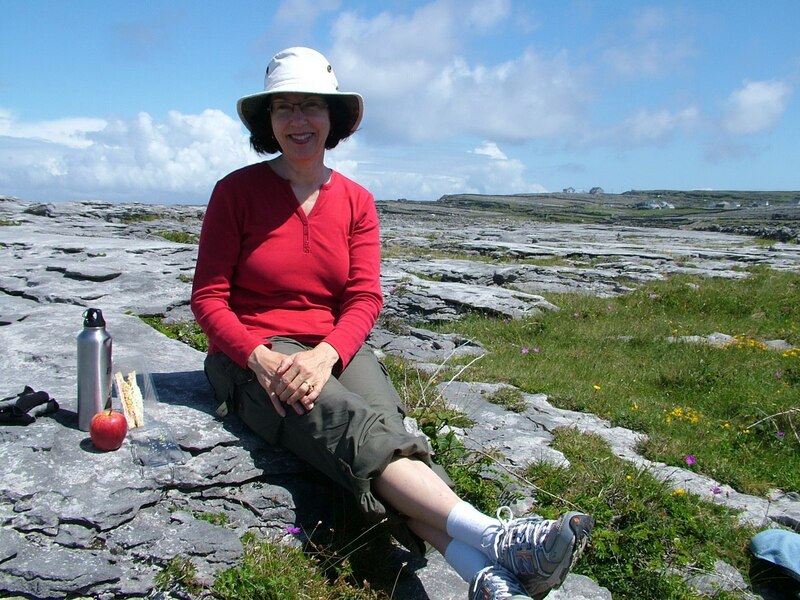 A quick stop at the nearby cafe afforded us some sandwiches and apples that were tucked into our backpacks before setting off on our bike ride on Inishmore Island. This map gives an overview of the road system on Inishmore Island where visitors are just as apt to encounter an automobile as they are a jaunting car, which is another name for a pony and trap. The morning’s uncertain weather had given way to clear blue skies, so Bob and I were excited to get rolling and uncover the historical past of this island that sits just offshore from mainland Ireland. 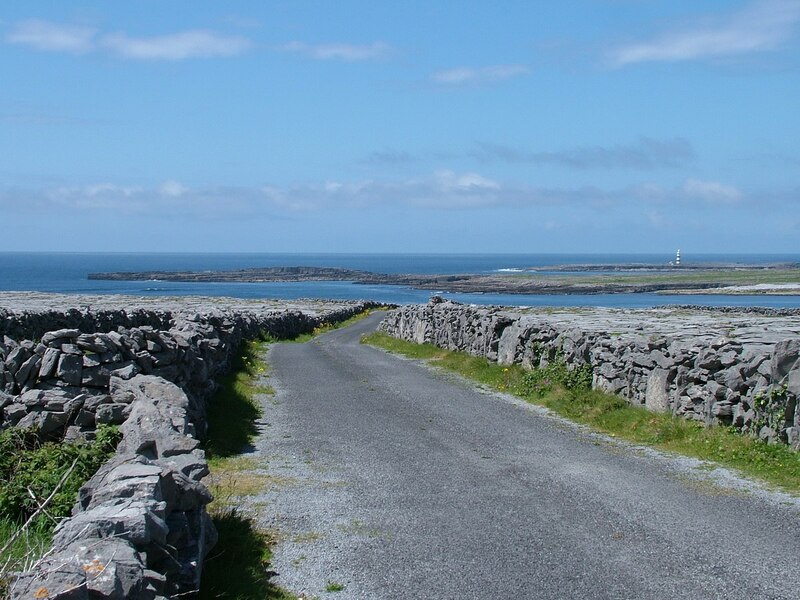 I was a bit intimidated traveling such narrow roads as those on Inishmore Island where minibuses and local traffic do not hesitate to speed by within an arm’s reach of pedestrians and cyclists alike. We did find the drivers very respectful of our presence, though, so I soon gained some level of confidence, and Bob and I glided along with the wind in our ears. 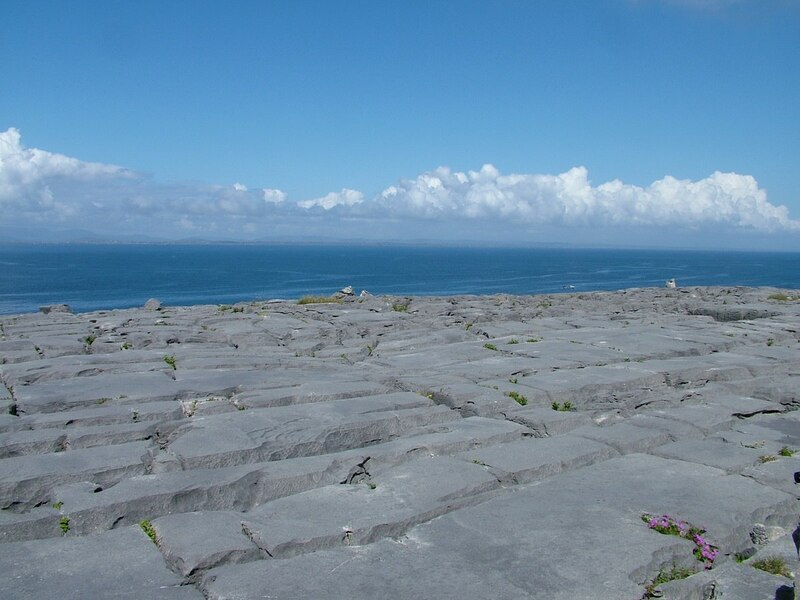 Inishmore, like the two other Aran Islands, is formed from a limestone ridge that presents a continuation of the stone pavements seen on The Burren. 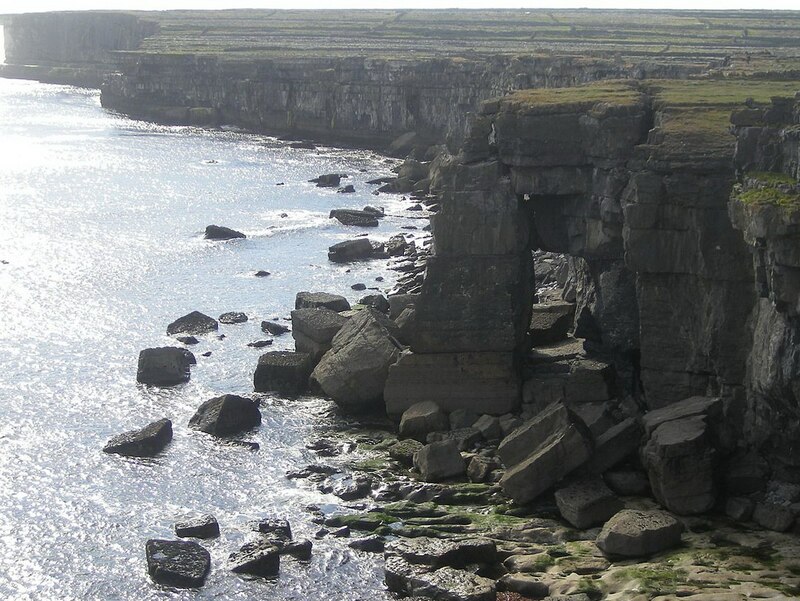 To make habitation possible, extreme physical labour was required by early settlers to clear the limestone slabs on Inishmore Island; they had to be broken apart and moved by hand. The resulting fragments of karst were used to build walls around what would become farmers’ fields. 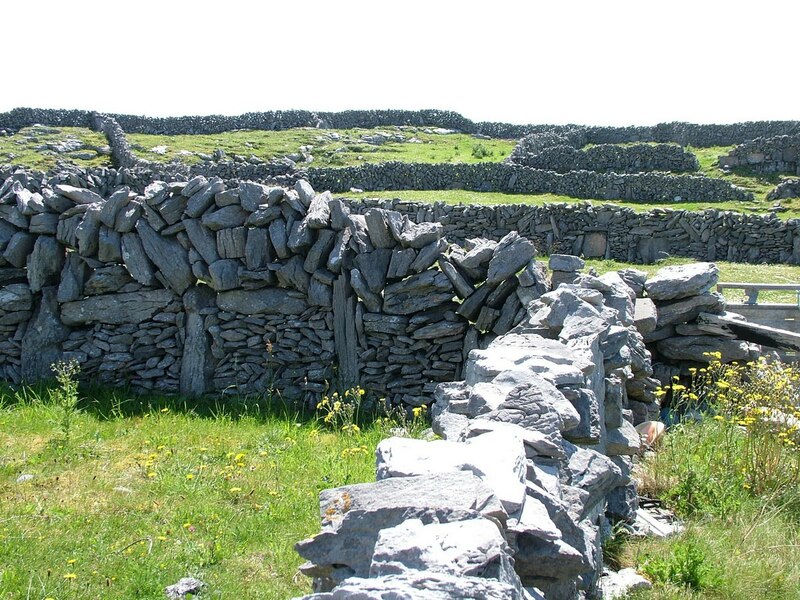 One of my favorite things about Inishmore Island is the elaborate network of intricately constructed stone fences that pretty much span the island from shore to shore. 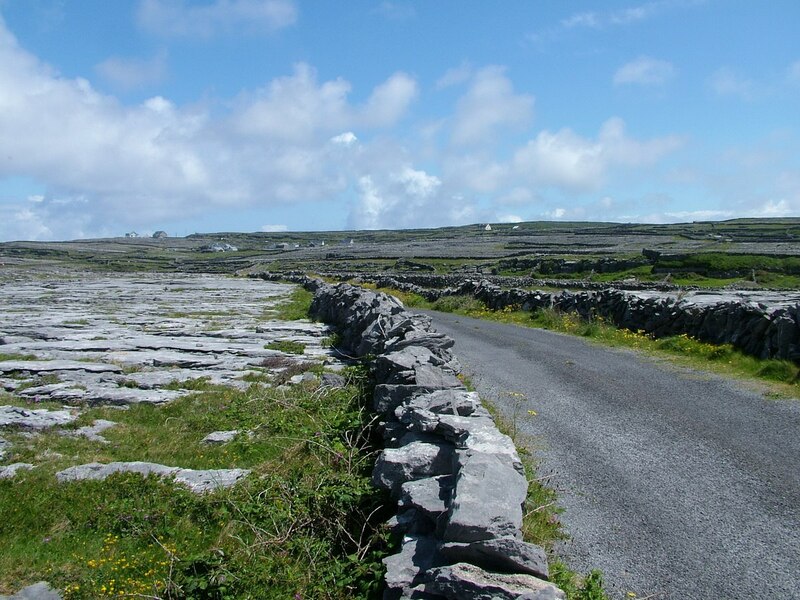 There are over 1,000 miles (1,600 km) of stone walls on Inishmore, a fairly significant number given that the island is 8 miles (13 km) long and only 2 miles (3 km) wide. As we cycled by neighboring farmers’ fields, it intrigued me to see that the stones of the walls had been arranged in different patterns. In talking with local people, Bob and I learned that the art of building dry stone walls is handed down from generation to generation, with each farmer using a slightly different technique to stack the rocks. It was easy to distinguish the unique styles of handiwork. We reveled in the bright sunshine that set everything aglow including our beaming faces. With not a care in the world, we rode along taking in the sights and savouring the simplicity of a place set back in time. 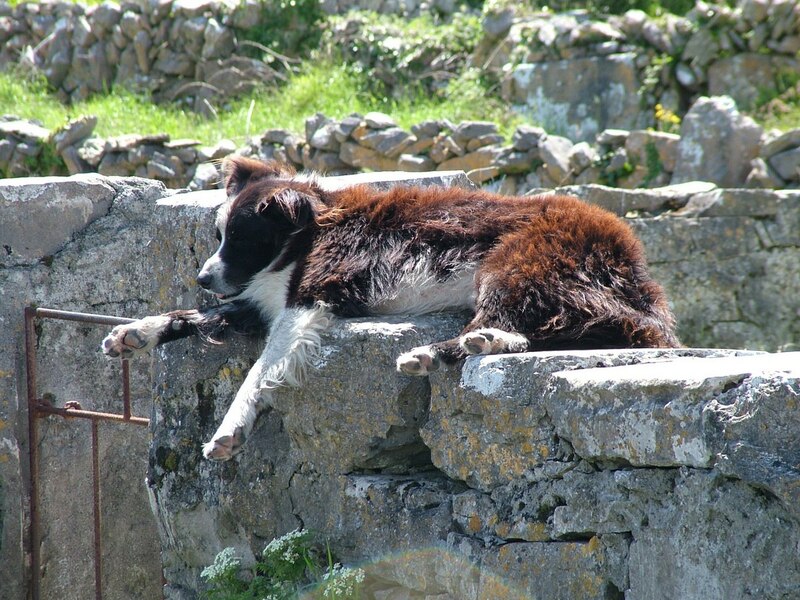 We noticed that most of the stone fences do not have gates, but instead use round rocks that can be rolled back and forth to block passage, yet here we see a simple iron gate guarded by an owner’s dog. The heat radiating from the sun-warmed stones had this furball lulled into somnolence. 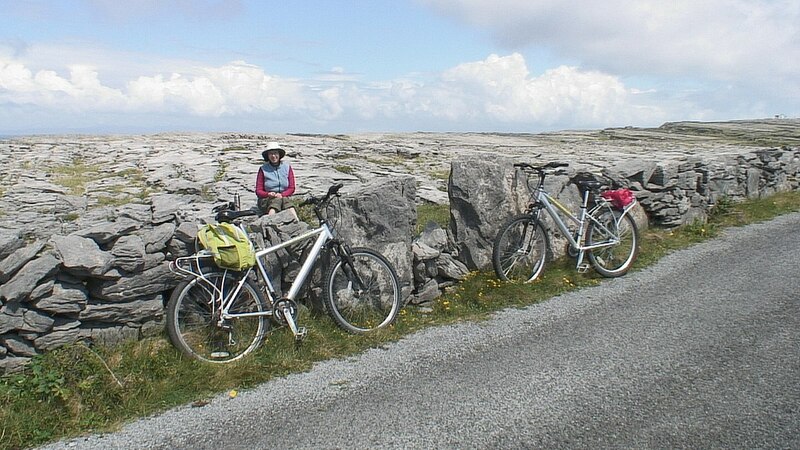 Our bike ride on Inishmore Island was accomplished with relative ease despite the endless undulating hills, and always the roadway was shouldered by nonstop stone fencing that faded into the distance. The ever-present limestone pavements were a constant reminder of the challenges faced by early settlers who had to make their own topsoil by hauling seaweed and adding it to the ample supply of sheep manure. It took centuries before the residents could eke out a living growing meager crops, but at least they were able to supplement their food supply with fish from the ocean so close at hand. I was absolutely delighted to see several quaint stone cottages tucked into the landscape of Inishmore Island, some as old as the hills themselves. The thatched roofs, in some cases, were sporting a healthy growth of vegetation where seeds had taken root in amongst the weathered straw. It is sad to think that some of these whimsical structures are falling into disrepair owing to the decline in popularity of actually living in them. 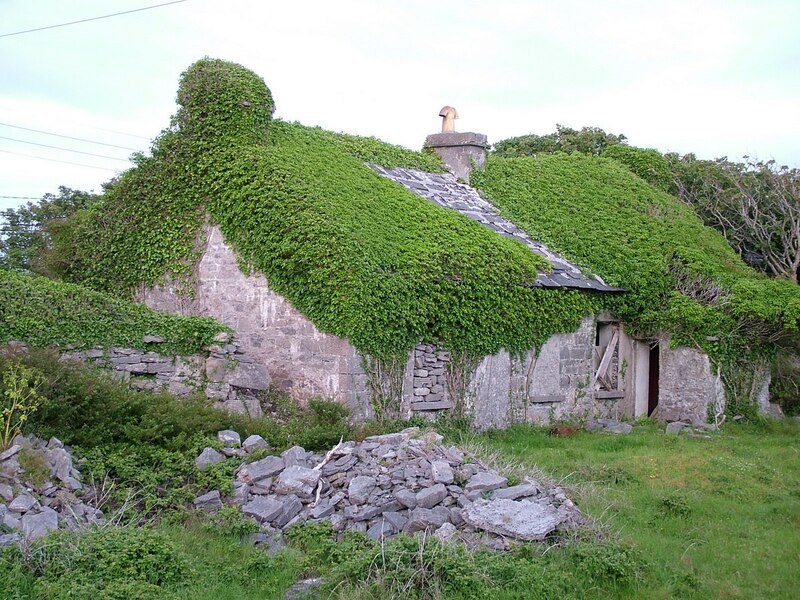 I can’t think of a more iconic symbol of Ireland than a thatched cottage, except for maybe the shamrock. 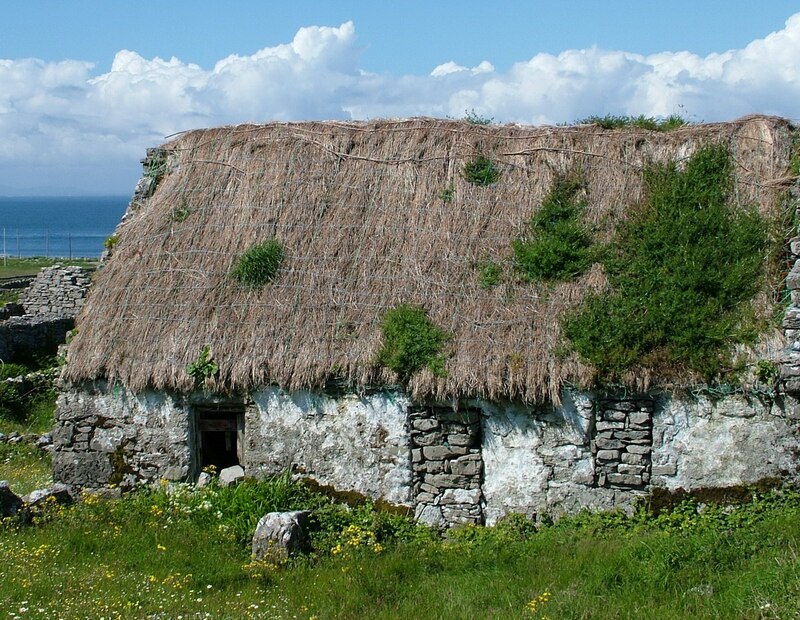 Back in the 1800’s, a good half of the people in this island country slept under the cover of thatched roofs. 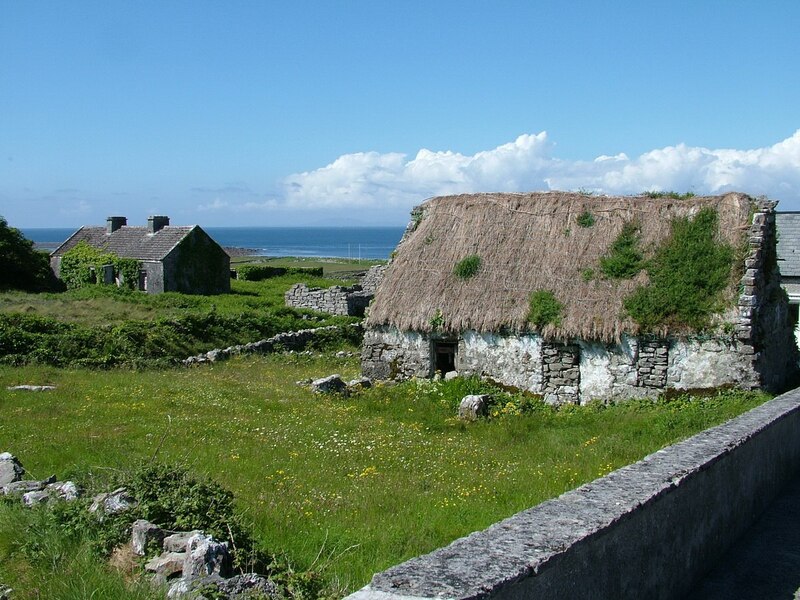 Today, there are only about 1,300 thatched cottages remaining in Ireland, so Bob and I felt incredibly fortunate to come across several on the tiny island of Inishmore. The thriving crop of vines stood in nicely for straw thatch even though the vines grow somewhat haphazardly and provide no protection from the weather. 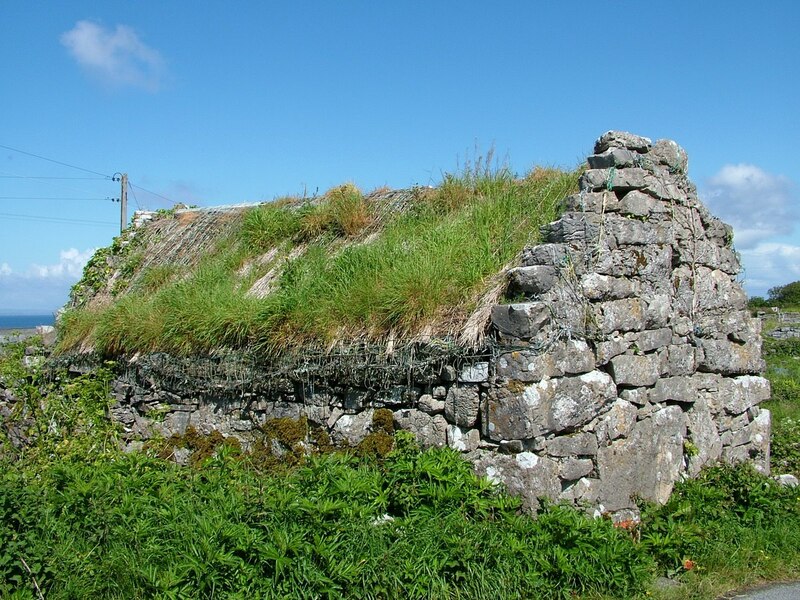 At one time, thatched stone cottages represented generations of impoverished Irish people who had to make do with whatever building materials were at hand. Stacked stones of every shape and size were meticulously fitted together to form walls and pillars that were mortared with a combination of wet mud and straw or animal matter. A sunny, straw bonnet of thatch consists of about 5,000 handfuls of straw applied over a layer of sod that lays on a timber base. Together, they complete the winsome abode. Today, thatched cottages are looked upon as environmentally friendly. These structures that grew out of centuries of history and tradition proved their worth by being so durable as to stand the test of time, but nowadays, it is hard to come by the necessary thatch or even thatchers to work the straw in the traditional manner. With that being said, Bob and I still found these rundown thatched cottages picturesque nestled between ancient stone walls and yawning fields of green. As we continued out towards the lighthouse at the end of the island, the smell of salty sea air tingled our noses and invigorated us. As we coasted along, we became aware of a slight downhill cant in the roadway. In either direction a desert of flat rock reached to the shore, and nary a soul could be seen across the whole end of the island. With our bellies beginning to grumble, Bob and I pulled off to the side of the roadway and looked for someplace to park it while we ate our lunch. A simple stile provided a gap in an ancient stone wall and allowed us access onto the limestone pavements. There was no shortage of flat, dry rocks to sit upon, and there, listening to the surf as it thundered ashore and speculating about the lighthouse that stood sentry for wayward ships, we munched on our modest picnic before venturing to the edge of the Atlantic Ocean. 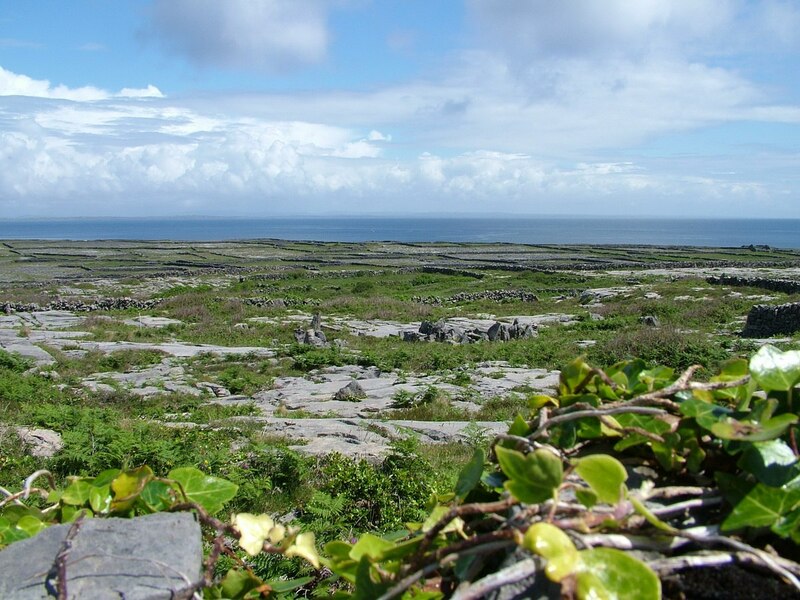 Situated very close to the western end of Inishmore Island, there are three very small, uninhabited islets. Two of the small, rocky islands are called the Branack Islands, but it is upon Rock Island, the most westerly of the three, that the lighthouse stands as a warning to passing ships. With powerful surf battering the limestone pavements at the shore, Bob and I had to be careful as we negotiated the smooth, rounded surfaces where they were slick with wet seaweed. 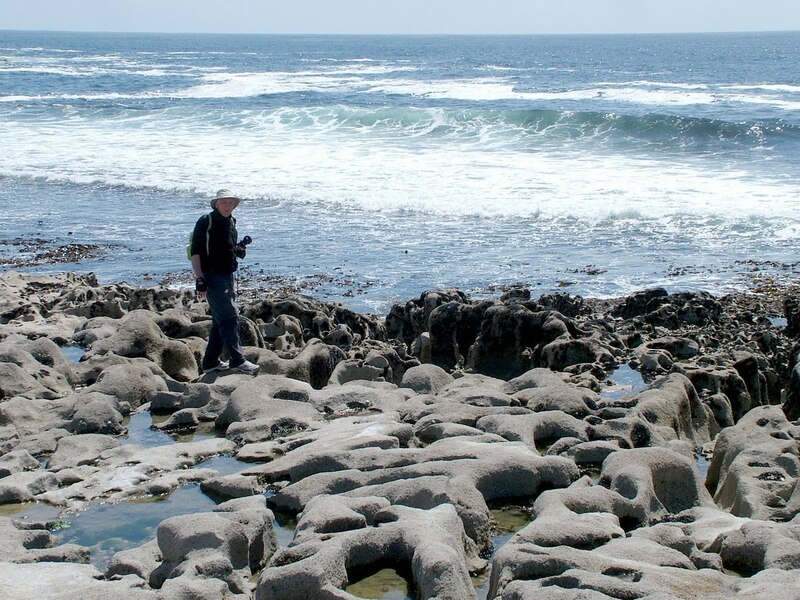 The potholed limestone, in some cases, gave way to heaps of almost perfectly round “river” rocks, whereas further removed from the pounding waves, massive limestone slabs lay off-kilter. To our surprise, an Eurasian Oystercatcher (Haematopus ostralegus) appeared out of nowhere on a knob of pitted limestone not far from where we were seeking shells. 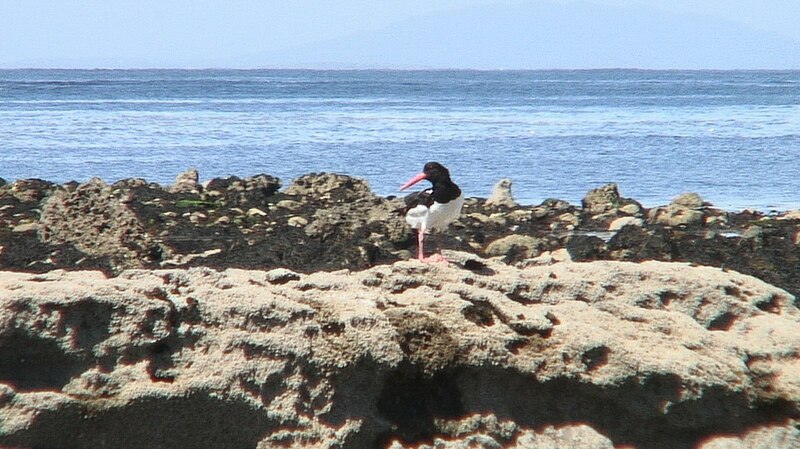 I was struck by the size of its red bill that enables these birds to smash and pry open mussels and oysters. 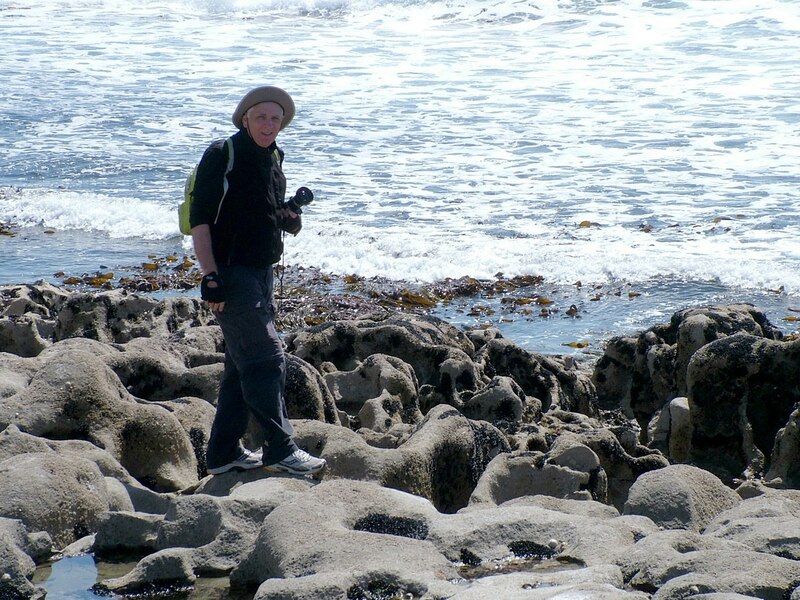 We poked about the rocks and seaweed for over an hour, enjoying the harsh pounding of the waves, the puddles that supported individual microcosms, and the fresh salty air. 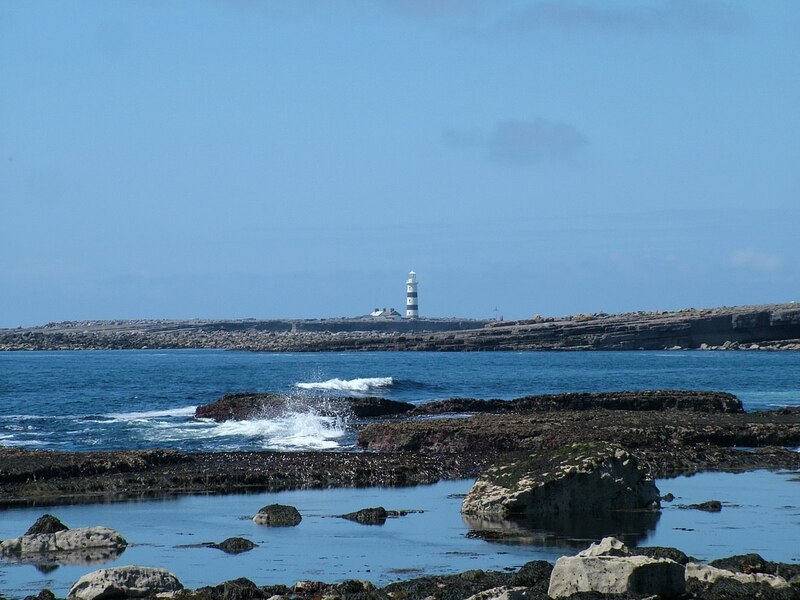 Then it was time to continue back towards Kilmurvey House and for that, we used a lesser-traveled route, the lower road or main coast road that follows the shoreline along the north side of Inishmore Island. 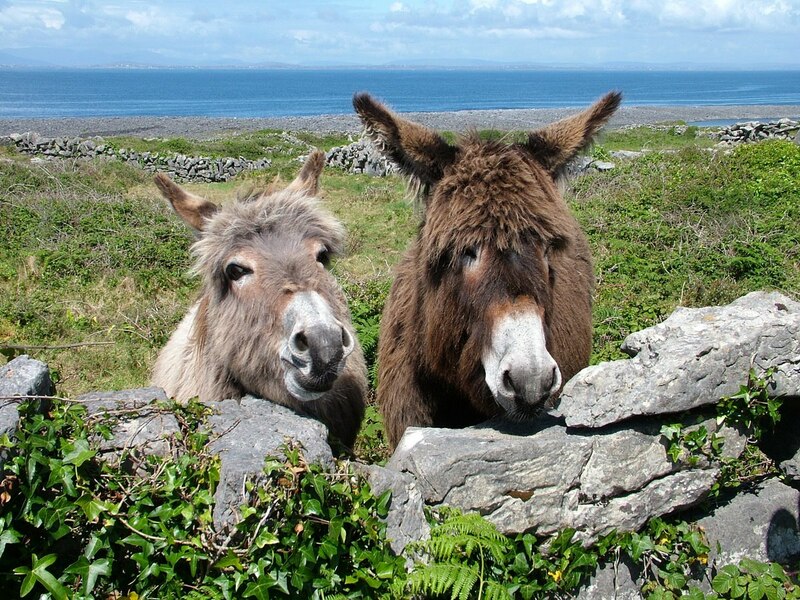 That is where we met up with a pair of friendly donkeys that beckoned us closer to the stone fence holding them in. Sheep used to be the primary livestock in the early days, bringing fame to the Aran Islands for their unique soft, fluffy wool and the sweaters knit from that wool, but a couple of different factors saw farmers turning to cattle as their main livestock, and now only 4 or 5 sheep live on Inishmore. 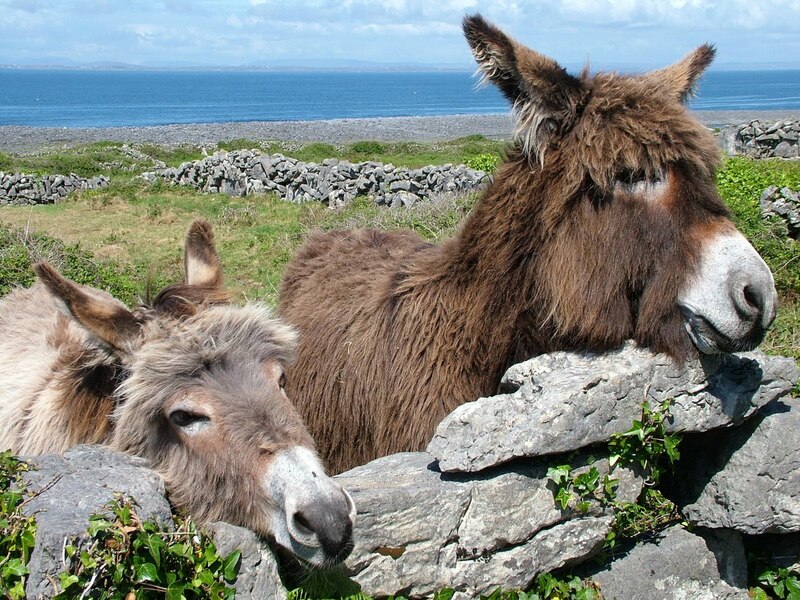 and a few donkeys confined within walled pastures or even the dooryards of some stone cottages. This pair of donkeys, in particular, had me in stitches as you will see in the small video clip below. Their boisterous welcome and rhythmic movements was prolonged, but I didn’t think to press the record button on my camera soon enough to capture it all. 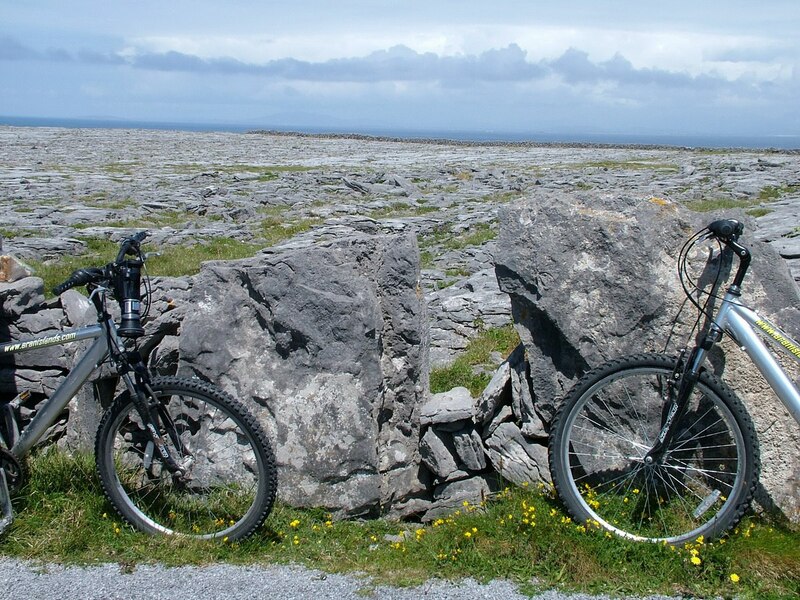 Having been inhabited for centuries, Inishmore Island is dotted with reminders of its early Christianity, and when Bob and I happened upon one grouping of ancient ruins, it was a good excuse to park our bikes once again and do some exploring. 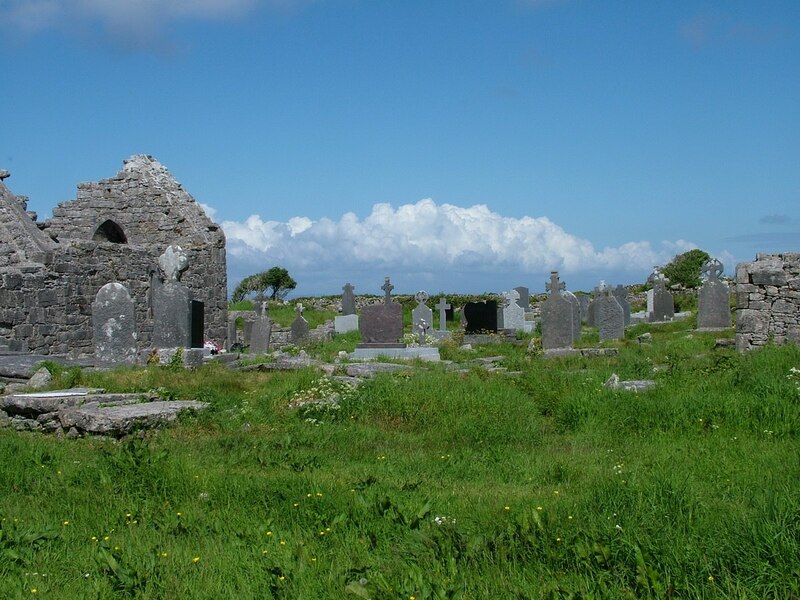 It was near the village of Eoghanacht that we found this gathering of historic buildings called the Seven Churches. 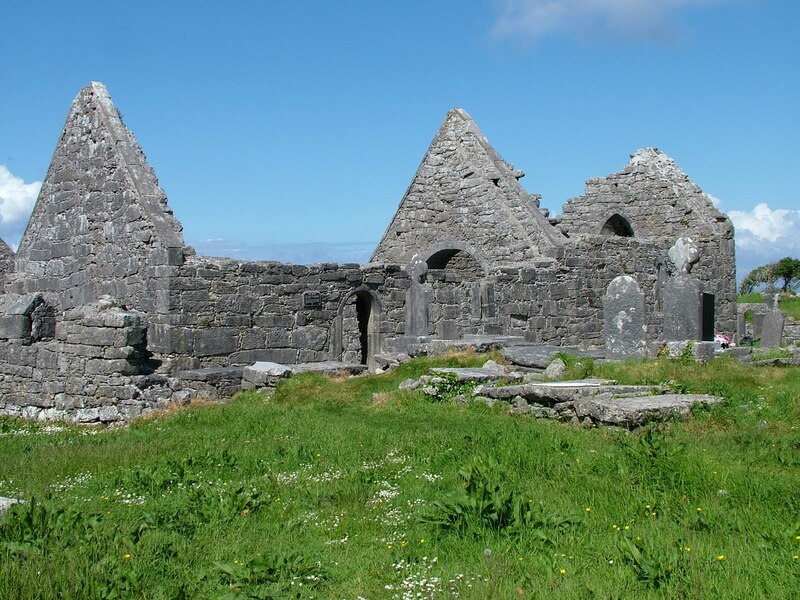 Only two of the structures on the site are actual churches, and they are surrounded by footprints of several other buildings that most likely were domestic in nature, used as dwellings by monks. 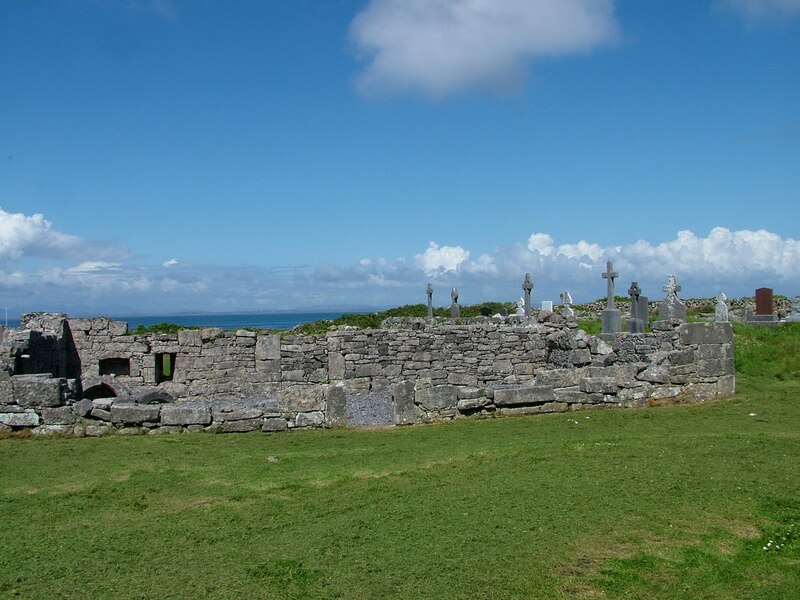 Why it is called the Seven Churches (Na Seacht dTeampaill) could allude to the number of structures amongst the ruins, or to the graves of seven saints at the location, but another popular consideration is that the Roman pilgrimage trail of the day included seven churches of which this religious site on Inishmore was one. 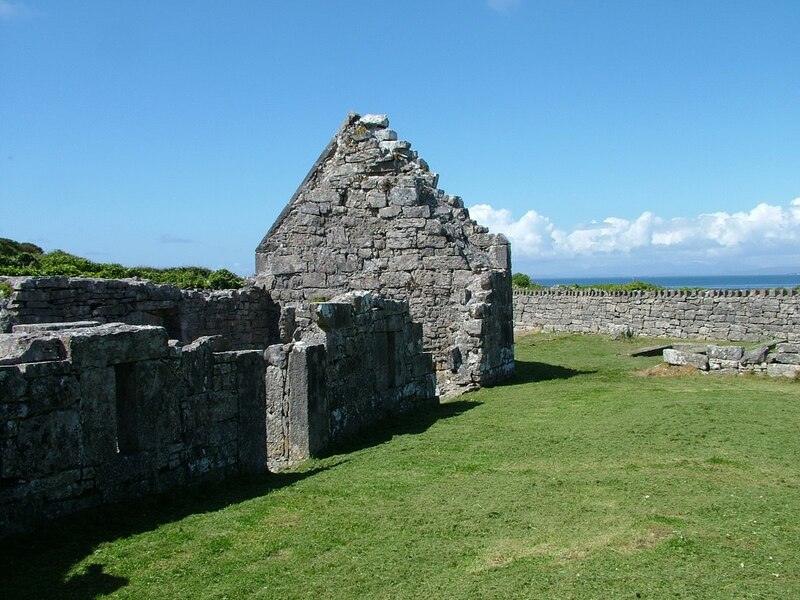 The largest church, Teampall Bhreacain, is named after St. Breacan (Brecan) who is thought to have founded the monument in the late 5th or early 6th century after destroying a pagan idol found there and converting the pagan Sanctuary into a Christian monastery. 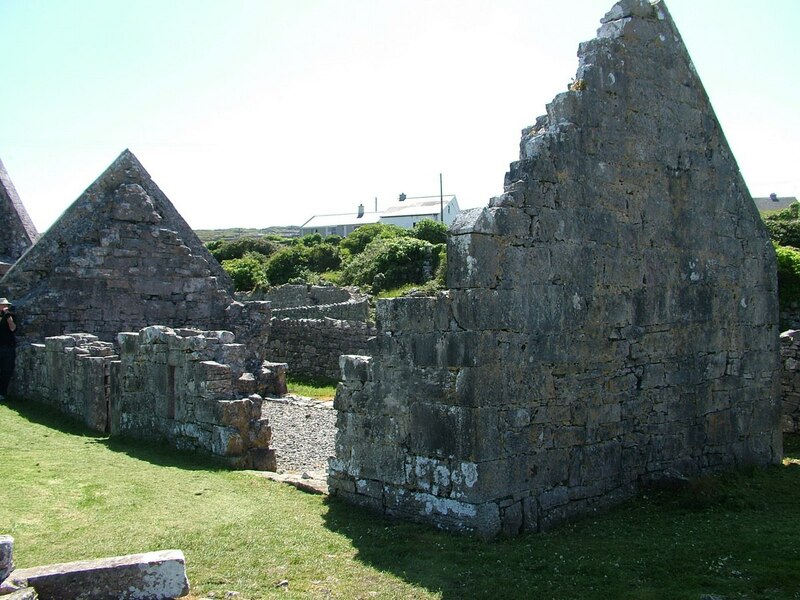 Construction of St. Brecan’s Church began in the 8th century and was ongoing through the 13th century with sections added over the ages that made it into the largest building and the main church on the site. 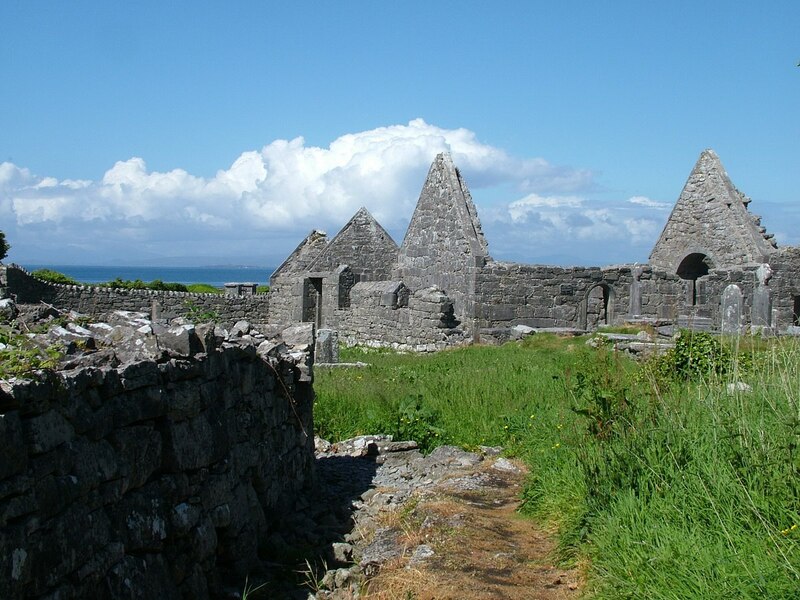 Even as early as the 7th century, the location became one of the earliest and most favoured Christian pilgrimage sites in Ireland. Fine masonry skills went into the construction of St. Brecan’s Church, and I found it interesting that, still today, it is possible to admire the ornate stonework and some ancient inscriptions that continue to be legible where they were written inside the west gable. 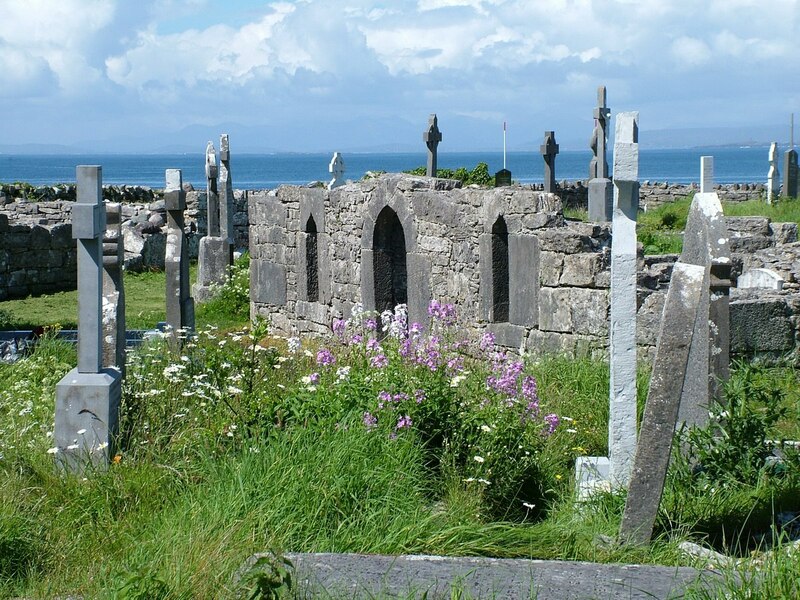 Saints and scholars made this isolated retreat their home during the 7th and 8th centuries, and often, European leaders would import some of the Irish monks to act as their scribes given the high rate of illiteracy on the continent. 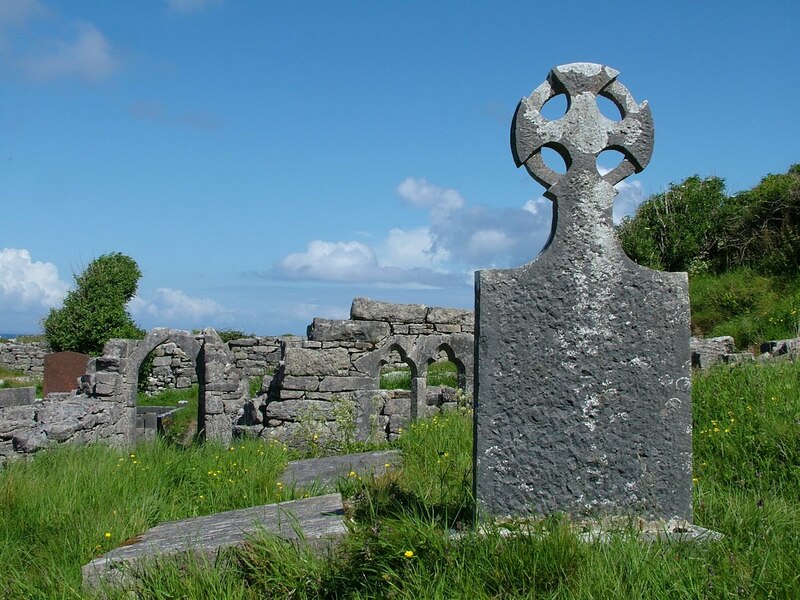 The Seven Churches soon became the most important monastic foundation in western Ireland attracting a steady stream of pilgrims, and it is ancient Celtic crosses such the one above that mark the graves of seven saints buried there. As Bob and I wandered the grounds, a profound sense of peace and quiet settled over us, almost as if the solitude of the monastic retreat still embodied the place. It was with deep respect that we admired the distinctive and stylistic crosses carved by talented stonemasons whose work was representative of the golden age of learning, literature and religious arts that flourished under the tutelage of the monks between A.D. 500-900. 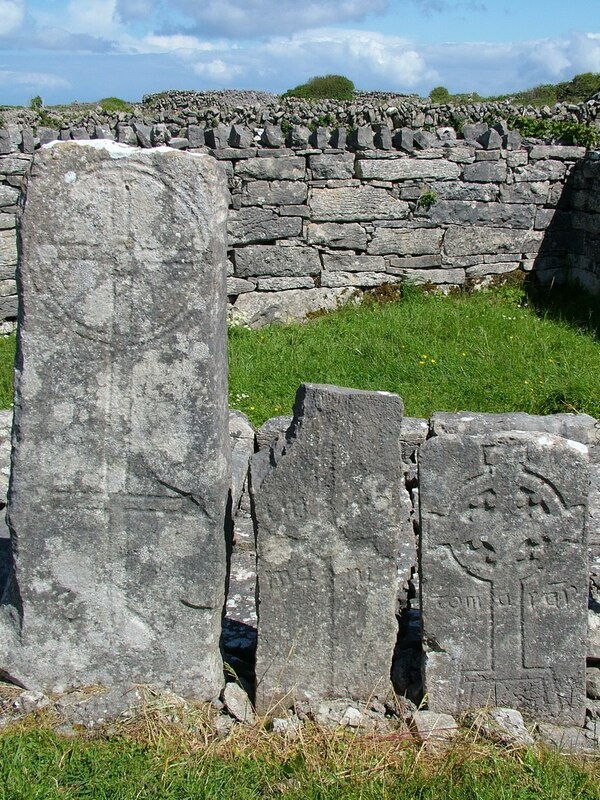 In addition to St. Breacan’s grave that is marked by a fragment of a tombstone, the oldest stone pillars on the site, three of which are seen above, bear inscriptions referring to a number of graves located directly behind them. Bob and I were the only two people sharing the sanctity of the graveyard for a long spell until another lone visitor came to spend some quiet time at the grave site of a loved one. We respectfully removed ourselves and sought our bikes that lay idly against a stone wall. The winding Coast Road brought Bob and me off the beaten track, through rugged countryside where a glorious patchwork of fields spread to the edge of the Atlantic Ocean. 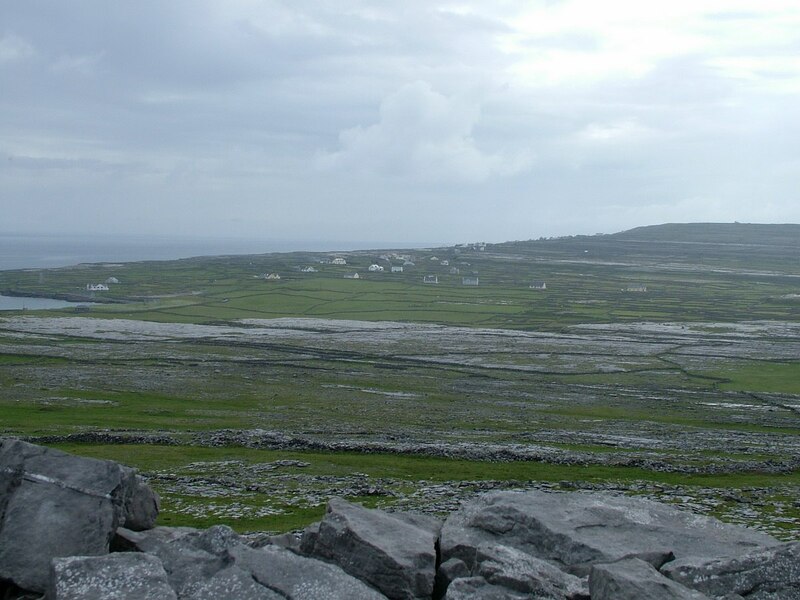 With only the occasional farming hamlet sitting prettily in the distance, Inishmore truly was an idyllic escape from the present world, a bastion of traditional Irish culture. With only one sleepy village on the island, Kilronan, and that a good five miles distant, we had to give thought to the time of day. Our hostess at Kilmurvey House had arranged transport to an eatery at the harbour for dinner, so Bob and I made haste on the return to our bed and breakfast. Still, there was time to cast a glance at the steep, rugged cliffs and windswept, rocky fields that surrounded us. For me, they exemplified the stark beauty of the blustery island. 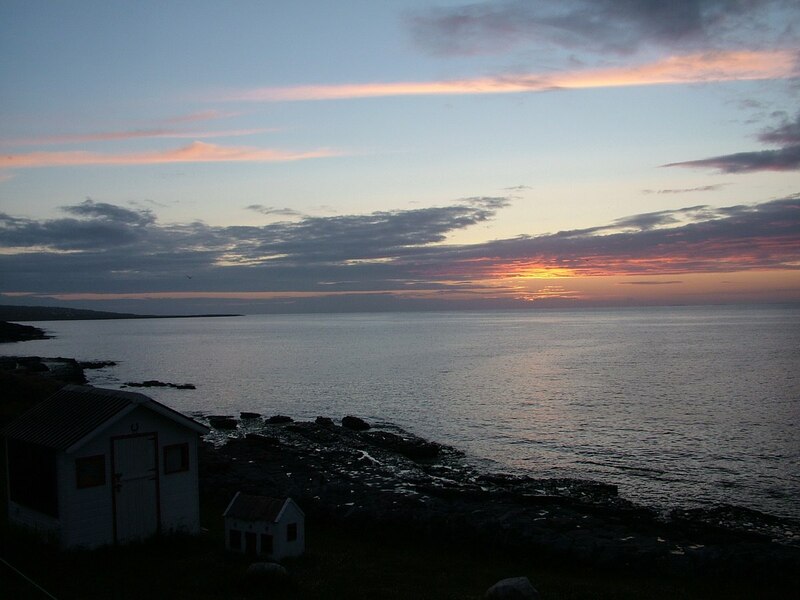 With darkness slowly enveloping the quiet island, Bob and I decided that we would prefer to walk back to Kilmurvey House rather than wait for the 10:15 p.m. pickup back to our lodgings. 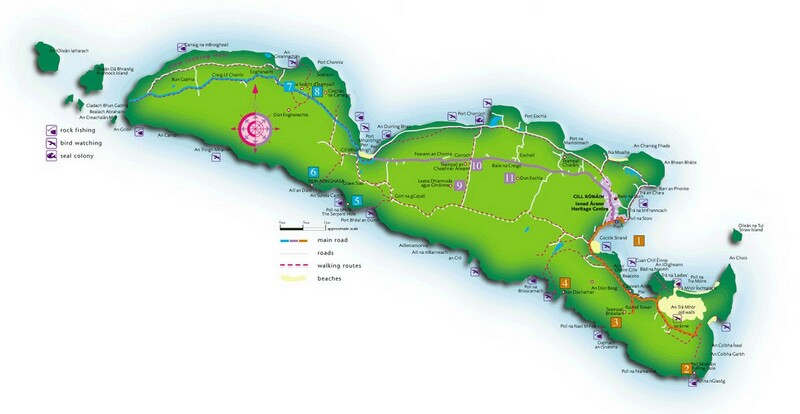 A couple of locals told us that to walk the distance of 4 1/2 miles along the Coast Road would take about one hour. 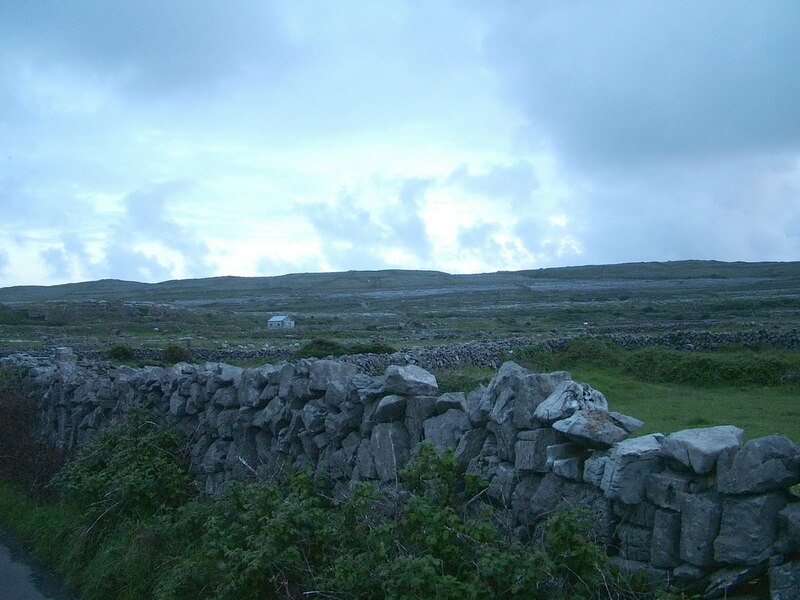 So, in the fading light, we set off to see what other treasures the island of Inishmore would reveal to us. Bob and I wasted no time and walked at a very brisk pace but all the while savoured the experience. 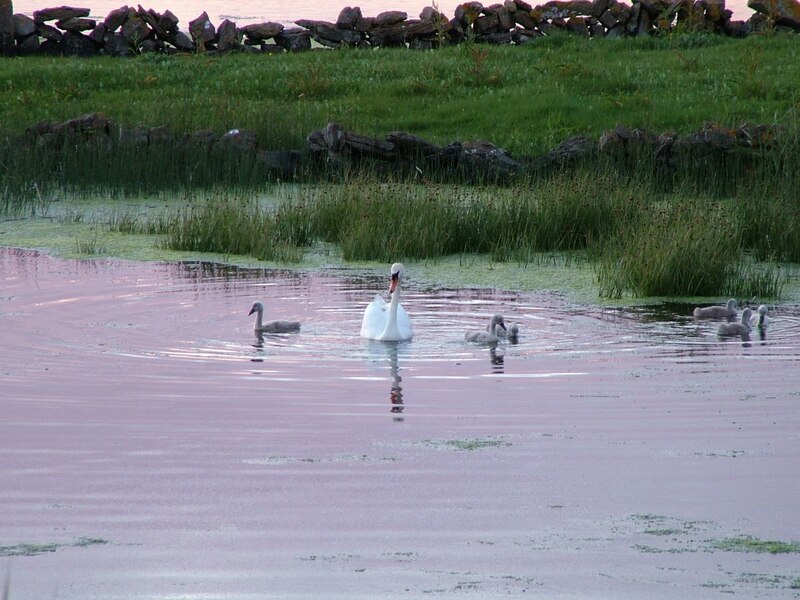 The air was warm, cuckoos courted us with song, curious horses sauntered closer to investigate the late-night wanderers, and sleepy swans with their cygnets swam lazily in a small pond about half way along to our destination. 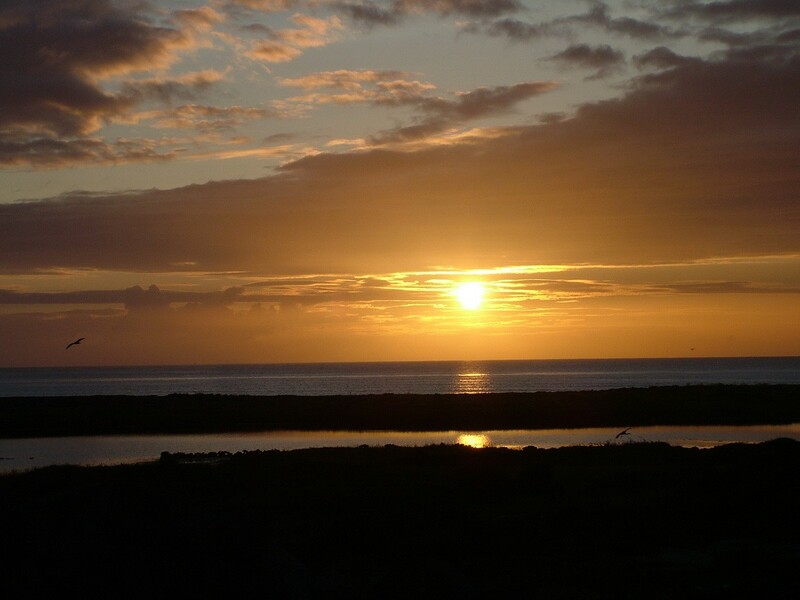 Before the sun painted the horizon in shades of gold and orange, we even caught sight of a few seals slipping beneath the waves in search of a meal. To be honest, the walk was verging on two hours in length, and I was getting concerned that maybe we had missed a turn or something, but really, the road system is so straightforward that that seemed highly unlikely. Even as we reached the bed & breakfast at 11:00 p.m., the soft light seemed more like that at early dawn than in the dead of night. 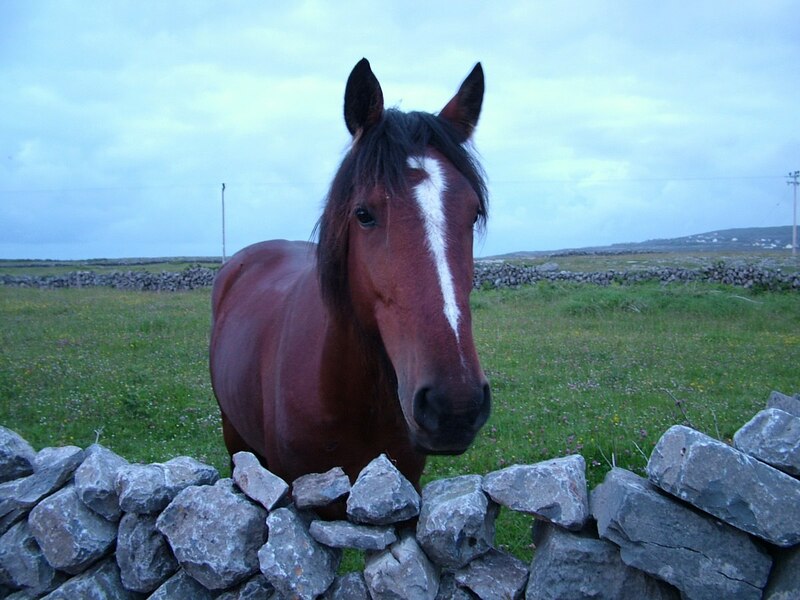 Bob and I reflected, on the simplicity of life on Inishmore Island. The peaceful setting inspired a heightened awareness of ancestral memories and a renewed connection to the past. We had thoroughly enjoyed our jam-packed day.